Read more: George Clooney and Amal Alamuddin's Venetian Wedding: Get All the Details! Most brides don't give an overwhelming amount of thought to their groom's boutonniere. In fact, we're sure many of you ladies had simply planned to have your florist pick a bloom from your bouquet and turn it into an accent for your guy's lapel. Sure, these pretty-yet-predictable picks are totally acceptable, but why not pick a mini arrangement that speaks to his style and still coordinates with your bridal blooms? But how do you go about finding that perfect boutonniere that will earn your guy's seal or approval but still feel like a cohesive part of your overall floral design? Start with color. White, green, and yellow are all popular shades for the groom's bout since they don't evoke an overly feminine feeling. 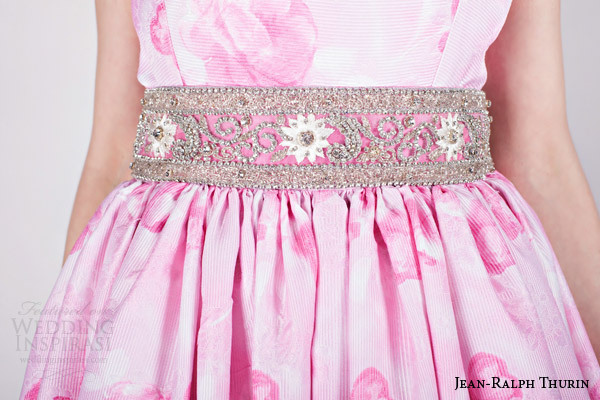 But if you're set on matching his bloom to your pink bouquet, consider coordinating with a more muted hue. Soft peach or orange-infused coral will keep his floral accent in a similar color family, but have an edge he'll surely appreciate. If don't want to have matching floral details, gift your guy with a bold boutonniere of bright greenery or cool succulents. Another idea we love? A cluster or non-traditional wedding flower like perennial astilbe or clematis. And if you and your husband-to-be are willing to think outside the box, we love the idea of swapping out flowers for something more unique. A family heirloom, like a cool pin or a vintage key, can be combined with berries or wheat for a wedding-worthy look that speaks to your groom's sensibility. Ready to see more amazing boutonnieres that both and your groom will love? Click through to see 33 great ideas in our full slideshow! Read more: George Clooney and Amal Alamuddin Had Their Bachelor and Bachelorette Parties Last Night! Can I Throw a Cake-Only Wedding Reception? Once you set your budget, it's time to make some tough calls. You'll have to weigh all of the wedding musts in your mind for what is an absolute and what can give. Sometimes, a dinner reception for the amount of guests you want to host is just a bit too pricey. It's totally understandable, a plated, full meal can up the cost by hundreds. If you're considering alternative reception and food options due to a strict budget, read this first. Can I hold an evening reception with just hors d'oeurves, cocktails and cake? You can, but just know that you're guests will be hungry and will most likely leave your party angry. Of course, you should never spend beyond your means, but there are plenty of alternative options that will help you save some cash while still keeping your guest's bellies full and happy. First, consider cutting down the guest list. If that's an impossibility, reconsider the time of your wedding — is it really necessary to throw an evening reception? People love brunch parties, and they often run for a lot less than a more formal chicken, fish, and steak dinner. A luncheon, too, will lower the cost of catering. Serving the meal buffet-style is a more affordable option as well. If you're stuck on the appetizer, cocktail, and cake combination, just be sure to hold it at an earlier hour and make sure to denote on your invitations that it will be a cake reception only. That way, between the ceremony and reception, guests can run out and grab a bite to eat. Read more: Can I Throw a Cake-Only Wedding Reception? 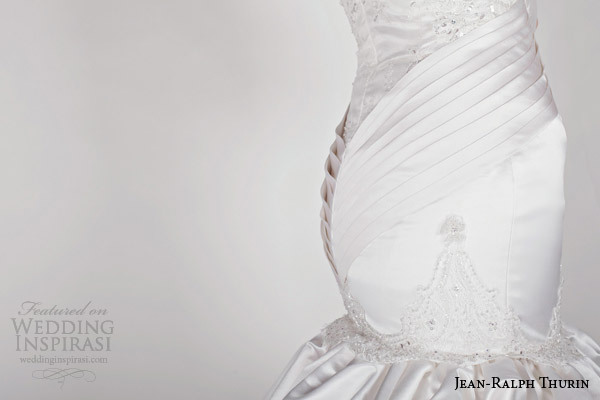 We’re wrapping up the week with some very unique gowns from Jean-Ralph Thurin’s Spring 2015 bridal collection. 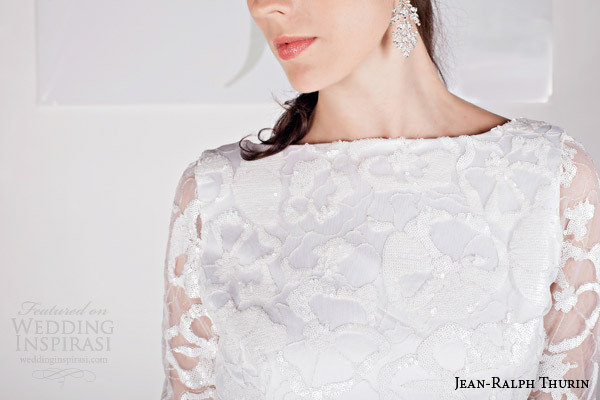 Jean-Ralph specializes in custom, one-of-a-kind wedding gowns, and the Spring 2015 collection features bold silhouettes, powdered tones and stunning embellishments. Born in New York to Haitian immigrant parents, Jean-Ralph’s designs have been influenced not only by his roots but through his extensive worldwide travel and love for architecture. Photos courtesy of Jean-Ralph Thurin. For more details, visit Jean-Ralph Thurin. Jessica Chastain was on a roll this week. From fuss-free and natural to full-on screen siren, her versatile hair and makeup looks were spot on. Here, three that will be perfect for your wedding day. At The Disappearance of Eleanor Rigby Premiere: There's a reason old Hollywood influences are still turning up on the red carpet, and it's not hard to see why. Glossy, side-swept curls and deep red lips totally stand the test of time. (Exactly what you want for your wedding day, no?) Chastain softened the dramatic look with bronzer instead of blush — it adds a subtle, modern touch. At The Disappearance of Eleanor Rigby Photocall: Chastain's naturally gorgeous features are on full display in this stripped-down look. We love how she put down the flat iron, instead going for a blowout with body. (For an outdoor wedding, this is a hairstyle that actually works with the wind!) Brown smoky eyes and berry lips add a touch of color to her no muss, no fuss style. We Asked, You Told: The Prettiest Wedding Bouquet Pics from Instagram! The soft, tissue paper-y petals of peonies. The vibrant purples of autumnal dahlias. The everlasting classic beauty of white roses. Is it any wonder that wedding bouquets are among our favorite pictures on Instagram? While we love sharing them, we get even more excited when our Instagram followers share photos of their own wedding flower arrangements. We recently asked our Instagram followers to use the hashtag #BridesBouquets on their pictures so we could see what flowers, colors, and styles are popular with real brides. The tagged photos were amazing, but here are our four favorites. Go bold with your colors: Linda Whitten owns Wedfully Yours, a floral and celebration company that has an Instagram filled with wedding inspiration! The photo at top left proves the power of a fall bouquet, with its giant purple dahlias and tons of lush greenery. Crisp, clean and classic is always in style: New bride Bonnie Draper happily shared a photo of her bridal bouquet, top right, which was filled with gorgeous white garden roses, peonies, and ranunculuses. White is the most traditional color for bouquets, but this arrangement manages to feel like a fresh update, thanks to the tiny pops of bright greenery. Grab onto giant peonies: These full, delicate flowers lend a soft, romantic vibe to every arrangement and always make a stylish statement. Bride Kristen Frey Wicker's bouquet, seen at bottom right, contains the classic pink peony color, as well as simple white roses for contrast. We particularly love how it looks next to the bridesmaid's bouquet, which has hot pink roses instead of the white. When in doubt, stick to simple hues: As much as we love a crazy-color bouquet, there's something to be said for a neutral-toned bunch of flowers that has a personality of its own. Florist Full Aperture makes a strong case for this choice with the picture at bottom left, which shows how ferns, olive branches, and assorted other white-and-green flowers and plants can really pop without the help of a hot pink or deep purple. Read more: We Asked, You Told: The Prettiest Wedding Bouquet Pics from Instagram! Let's get this party started! George Clooney and fiancé Amal Alamuddin have officially arrived in Venice to start their much-anticipated wedding festivities. First, thing's first: Once Clooney and Alamuddin entered Venetian territory, they took a water taxi, aptly called "Amore," to the iconic Belmond Hotel Cipriani, where they hosted a small gathering to welcome guests. The first of many celebrations was held in Cipriani's bar hall, where guests sipped on bellinis and champagne and enjoyed the view of a hundreds of white-and pink Cyclamen blooms. Famous faces have begun to flood the Venetian streets for the momentous occasion, including Clooney's bestie Matt Damon and wife Luciana, Cindy Crawford and her husband Rande Gerber, John Krasinski and Emily Blunt, Richard Kind, Ellen Barkin and Gabriel Byrne, Clooney's producing partner Grant Heslov, his cousin Miguel Ferrer, and Vogue Editor in Chief Anna Wintour. And while the wedding seems to be causing quite the stir in the city, locals couldn't be more excited about the pending high-profile nuptials in their hometown. "Ever since he admitted he would be marrying in Venice a few weeks ago, everyone wants to be in on it," local Liliana Sermonetta told People. "Where are they staying, what are they eating, will they take a gondola ride?" As for tonight's agenda, Clooney and his bride-to-be will both be celebrating their bachelor and bachelorette party. E! News reports that Clooney's future wife will party with eight girlfriends at the Aman Canal Grande, while the actor will head back to Cipriani where he will gallivant with the guys. Saturday is the big day! Clooney and Alamuddin will say "I do" in a symbolic ceremony, officiated by Rome Mayor Walter Veltroni, following by a luncheon with guests on Sunday. They won't officially be Mr. and Mrs. Clooney, though, until Monday when they have a civil ceremony according to reports. Sounds like a jam-packed wedding weekend! Stay tuned for even more Clooney wedding developments over the course of the next few days. Did Mary-Kate Olsen & Olivier Sarkozy Secretly Get Married?! In their made-for-home-video acting days, Mary-Kate and Ashley Olsen were known for their ability to "solve any crime by dinnertime." This week, though, people have been doing some special sleuthing of their own. How so? Mary-Kate, who has been engaged to Olivier Sarkozy since early this year, somehow started wearing a wedding ring instead of her giant engagement ring with no one noticing — until now. And according to reports, that change in jewelry is proof that the duo got married! The wedding band was first spotted after paparazzi snapped photos of the happy couple munching on a sandwich on a Hamptons bench this weekend. In the pictures (seen here), both Olsen and Sarkozy are wearing gold wedding rings on their ring fingers. Pret-a-Porter reached out to Olsen's rep in hot pursuit of confirmation, but Lucky snagged an anonymous source who confirmed suspicions. We must admit that we're impressed with their stealthiness! Impressed and, obviously, slightly disappointed. For starters, we're sure she wore an unbelievable dress, even if they exchanged vows in city hall. After all, did you see the dress she and twin sis Ashley designed for their friend? They put their The Row and Elizabeth and James to the ultimate test and it really paid off. Secondly, a secret wedding dashes our dreams of a double wedding with fellow engaged sister Elizabeth Olsen. Oh, well. Besides, it's rumored that Ashley may, too, get engaged soon. We can still keep our double wedding hopes alive! Read more: Did Mary-Kate Olsen & Olivier Sarkozy Secretly Get Married?! Is it Possible to Quit Being a Bridesmaid? Sure, being a bridesmaid is a huge honor, but it's never 100 percent easy for the bride or her 'maids. 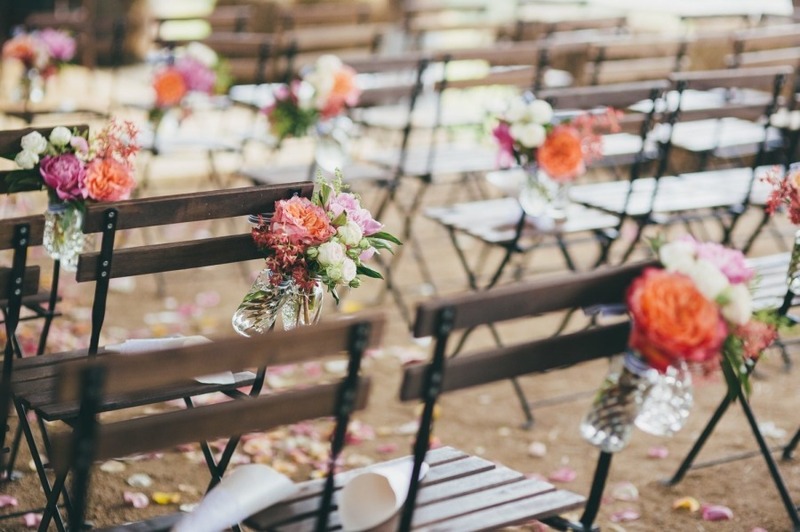 Of course celebrating one of your best friends or closest family members on the big day and helping to ensure it's extra special is amazing, but there are some logistical sides to participating in a wedding party that could throw a wrench in everything. Financial responsibilities are probably the number one cause of trouble, second to the long list of pre-wedding responsibilities, or a 'maids negativity (or jealousy) towards your relationship. As disappointing as these conflicts can be, there are solutions. Whether you're sick of your bridezilla best friend, or a 'maid of yours is being extremely unsupportive, here's some advice for how to quit being a bridesmaid or fire one tactfully. Can I quit being a bridesmaid if it's too much of a financial burden or if my friend has turned into a major bridezilla? First and foremost, whenever a conflict arises you should talk to the bride candidly. Especially with money conflicts, be open and honest about what you can and can't afford. Hopefully she'll be open to finding a new dress or picking a less expensive locale for her bachelorette. If all bridesmaids are in agreement, you should stand up to the bride together as a group. She's been your friend for years, she should understand! How do I politely fire a bridesmaid who has been extremely negative the whole process? Bridesmaids are there to support you, and if she's not willing to be there for you, then she isn't not doing her job. Speak honestly about your concerns, and if she's not receptive, you can always say that she may not have realized the responsibilities when she signed on, and because she's so dear to you, it's ok if she just wants to attend the wedding as a guest. Read more: Is it Possible to Quit Being a Bridesmaid? Las Vegas may have a reputation for bachelor parties and quickie weddings, but it's also a major destination for some post-wedding bliss. According to Facebook, the Sin City is the most popular place for newlyweds to spend their honeymoon in 2014. Facebook made the fascinating discovery by tracking couples who both posted a marriage event in 2014 and checked into a location within two weeks of their self-identified marriage date. At-home honeymoons were excluded, as check-ins within 20 miles of the couples' home location weren't counted. Vegas garnered the greatest share of check-ins by honeymooners overall, but interestingly, U.S. couples were much less likely to check in there than non U.S. Couples. See more: Top 10 Resorts in the Mainland U.S.
Not only did the social networking site narrow in on this wildly-popular vacation location, it also examined other hotspots, as well as which countries' residents travel the farthest for a post-wedding getaway. Unsurprisingly, Hawaii, a common choice for Americans and foreigners, dominates five out of the 10 places global honeymooners traveled to when choosing a destination in the U.S. When countries outside the U.S. were included, some amazing overseas destinations made it high onto the list. According to Facebook, 19% of U.S. honeymooners travel internationally. Those frequent flier miles have nothing on those of South Korean honeymooners, though. Facebook found that couples from South Korea travel the greatest distance to get away, with a median trip of 4,000 miles away from home. How's that for an exotic honeymoon?! The full study results, as well as charts and other information, can be seen here. Since the company's inception in 1997, Sonnier & Castle has taken a unique approach to wedding catering. "When we first launched the business, our clientele was younger and their point of reference was the food they enjoyed in New York's top restaurants rather than traditional catered dinners," recounts owner David Castle. With a keen eye for detail and an impressive roster of top NYC chefs, Sonnier & Castle's offerings are fit for the foodie couple who really want to impress their guests with their wedding menu. So what exactly takes a catered affair from basic to unforgettable? Sonnier & Castle shared their top seven tips for impressing your guests with one of the best parts of a wedding — the food! Go local: Choose your menu based on local ingredients that will be in season for your wedding. Think: sweet corn at an August soirée in the Hamptons. This will provide a special experience for your guests as well as dishes with maximum flavor. Remember it's all about the presentation: Feel like everyone is serving shrimp during the cocktail hour? Jazz up the display with a custom ice creation, such as the ones by Okamoto Studio. Also think beyond the white-rim plate. Serve your first course on something unexpected that complements the food being served such as a Himalayan pink salt block or a natural slate platter. Mix high and low: Serving caviar canapés followed by pigs in a blanket will be sure to please all your guests and keep them guessing about what delicious food will be coming up next! Change the schedule: Shake up the three course routine. Serve dessert as passed sweets in another room or serve the first course while guests are seated before a main course a buffet. Or consider adding an extra, small course such as an amuse-bouche. One of our most popular choices is seared scallop with pear mouse and pancetta brittle. Embrace the DIY trend: Create opportunities for guest interaction with a make-your-own buffet stations. We're not talking a cheese-and-crackers display either. An S&C client favorite is the ramen bar, where guests can choose up to 12 delicious ingredients. Do a throwback: Serve nostalgic favorites like Rice Krispie treats and Mallowmars that have been recreated with gourmet sensibility. Because who doesn't love an upscale rendition of their favorite childhood treat? Give a doggy bag: Send guests off with an edible and personalized favor, such as you and your new husband's favorite sweet-and-salty snack with custom packaging. How are you personalizing your wedding menu? Share your tips by tweeting us @BRIDES! Read more: Vanessa Williams Is Engaged! There's more to fall than pumpkin spice lattes and cozy sweaters (though those are nice, too). 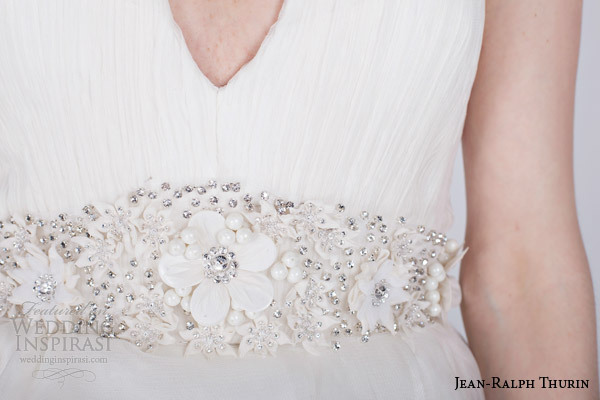 With the shift to cooler temps comes one of the prettiest wedding seasons! To help you give your ceremony and reception an autumnal aesthetic, we pulled together five must-haves that represent the hallmarks of the season. Disney is not one to shy away from a fairy-tale romance. But for some reason, the network has never aired a proposal on one of their TV shows — until now! Tonight's episode of Jessie, a show about an aspiring actress-turned-nanny for a wealthy Manhattan family, will feature an adorable engagement for the first time in the channel's history. Back in April, the network announced the forthcoming storyline. "Jessie is an adult, and we felt we could tackle this in a way that still feels appropriate for our audience," said Adam Bonnett, the Disney Channel's executive vice president. "The way we deal with this romance is very pure Disney fairy tale." At the same time, Debby Ryan, who plays Jessie, expressed her excitement for her character's milestone. "I've told enough secrets for now. Excited to share this part of my girl's life with you; #JESSIESgettingmarried," she tweeted. In tonight's episode "No Money, Mo' Problems," Jessie's tuxedo-clad boyfriend Brooks (Pierson Fode) waits for her in her employer's rose petal-strewn foyer. She, obviously, is a bit caught off guard by this surprise. He starts to declare his love for her, saying sweet things like, "You are the most amazing girl I have ever met. You love me, for myself. You make me a better person. You make me happy." The hilariously quick-witted Jessie then retorts, "Ok, this is usually followed by a but..." But Brooks reassures her, "No buts. I realize now that there will never be a more perfect girl for me. And since I'm lucky enough to have found the girl of my dreams, I see no reason to wait." Our favorite line, though, is when he drops down on one knee, and Jessie jokes, "Wow, is that a diamond ring or a disco ball." Too cute! You can watch the full clip on E! News, or watch Jessie tonight, when it airs at 8 p.m. on the Disney Channel. We would like to introduce you to Wedding Republic, an online wedding registry that is perfect for couples with unique needs. You heard this before: never expect gifts at your wedding. The reality is that most guests start thinking of what to give the marrying couple the moment they receive an invitation from them. Wedding registries are a fantastic to way to give your wedding guests gift ideas. However, there are many instances where a traditional department store wedding registry just don’t cut it. You have “stuff”, lots of it, and no, thank you, you don’t need another toaster. Maybe you prefer experiences rather than things. Perhaps you have a very unique taste in terms of home décor and prefer to keep it that way (Star Wars themed home, anybody?). Frankly, you’d rather the money set aside for your wedding gift be channeled somewhere else, like your honeymoon or a favorite charity. Should you just ask for cash instead? The golden rule in Wedding Etiquette 101: it is never polite to ask for cash. Enter Wedding Republic, a registry that allows you to get cash, without having to explicitly ask for it. How does it work? When you set up a registry at Wedding Republic, you have the flexibility to define your own registry gift items, whether it’s a honeymoon to Europe or a deposit for your first home. Your guests contribute by sponsoring a piece of the puzzle that makes up the registry item. You get to withdraw the funds for these items after you close the registry. Wedding Republic uses a secure payment gateway and a 256-bit SSL certificate, ensuring all transactions are conducted securely. 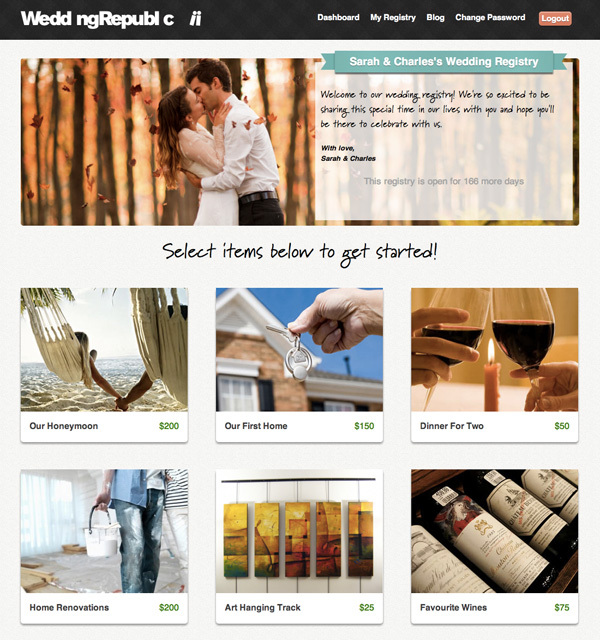 View a sample wedding registry. Meaningful: With Wedding Republic, guests get to contribute towards gifts that the wedding couple really need. Convenient: Guests can simply browse the registry online to view a list of gift items. 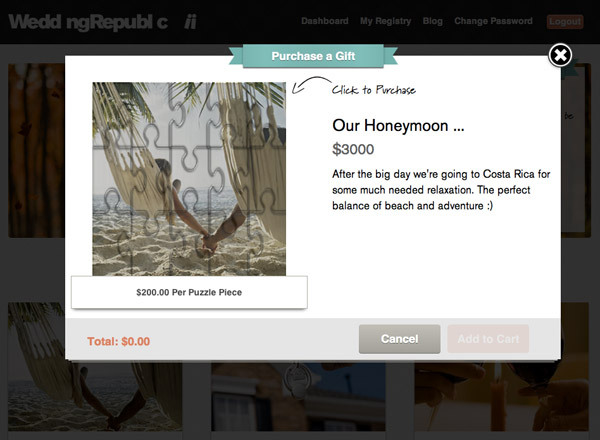 They then make a purchase by clicking on a piece of the puzzle that represents an amount that will go towards the value of the gift. A 5.5% administrative fee is charged to the guest upon purchase. 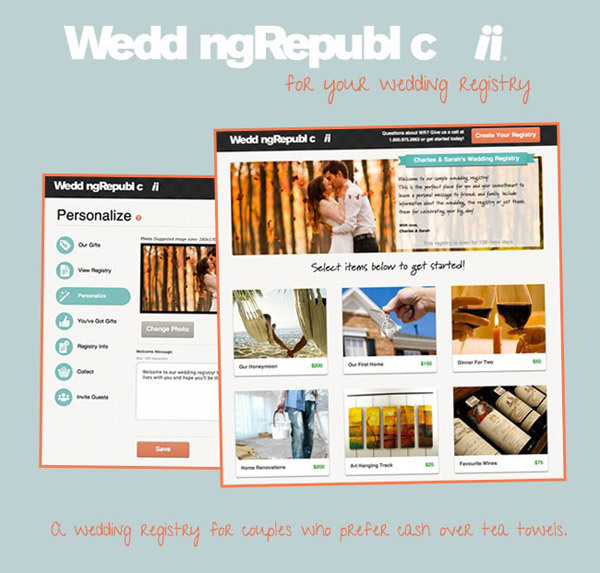 Convenient: It is easy create, share and manage a registry at Wedding Republic. As guests contribute, you’ll see a detailed list, so you send your thank you cards quickly and easily. Flexible: The best part of a Wedding Republic registry? Couples get to list items that they really need. Create Your Wish List – The fun part! Choose from a list of gift ideas or create personalized registry items with gifts or experiences that you really need. Share It With Your Guests –Spread the word about your registry with friends and family through email, Facebook or by adding a custom link to your wedding website. Watch As Your Guests Contribute – Login to see who has contributed to your registry. If you forget or want to change something, you can always edit your list! Collect Your Funds – When you’re ready to close your registry, simply login and collect your funds* (an administrative charge applies). Interested in setting up your own unique wedding registry? 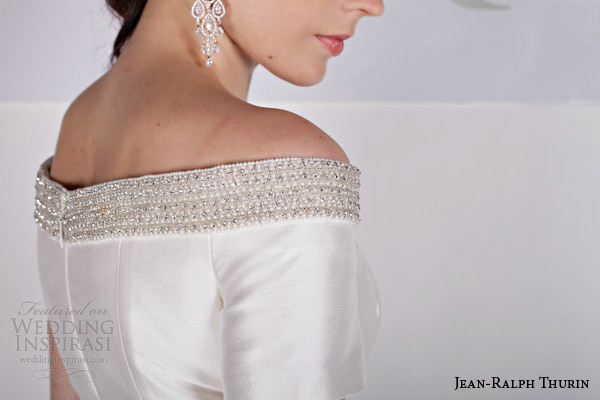 Head on over to Wedding Republic to give it a try! "If you're a bride using Pinterest to help you come up with the look and feel you like for your wedding, glance at your entire board and you'll easily find some similarities, whether in color, texture or design," points out Francesca DiSalvo-Follmer, owner of Pure Luxe Bride.Â This should help you arrive at a more informed decision you won't regret. 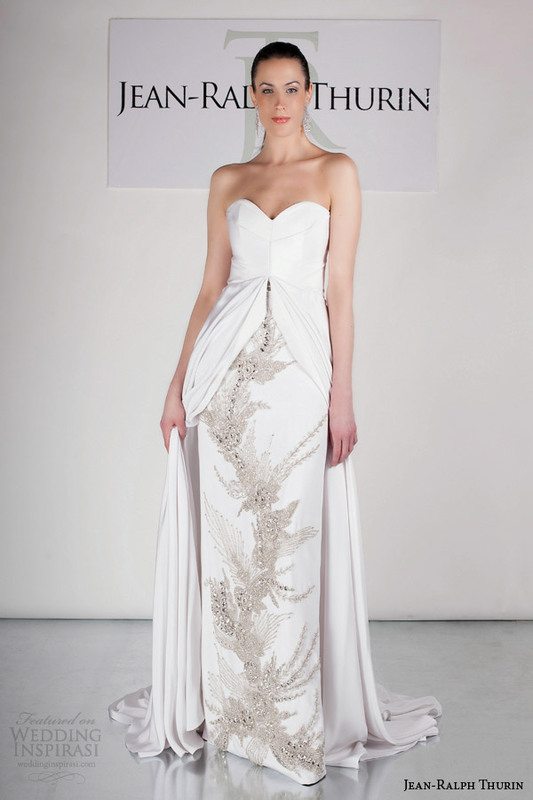 Carlos Ramirez, founder and designer of Liancarlo, is known for his beautiful work with embroidery and color on everything from wedding gowns to accessories and bridal headpieces. We sat down with the Miami native to discuss his upcoming collection debuting at Bridal Fashion Week this October, as well as his top style tips for brides and his inspiration. "Each season, my initial inspiration comes from fabrics — you fall in love with fabrics and then start to determine what can be created. 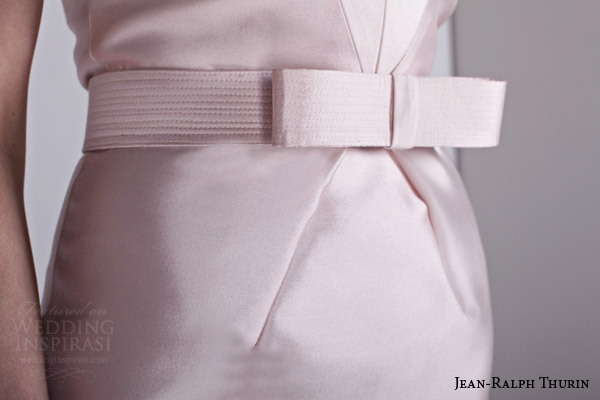 Along the way during the design process, there are other inspirational influences, which can range anywhere from the straps on a top that a girl in my yoga class is wearing to a conversation I have with a bride at a trunk show!" Ramirez tells us. The designer continues, "Many things spark my imagination, and often the process isn't a straight line. I also paint, and often times shapes that I develop in painting become the seeds for embroidery patterns in a collection." Expect beautiful new fabrics and colors in the upcoming Liancarlo collection. "I am designing with a gorgeous new guipure fabric that I worked on with an Italian mill; it's woven like macramé. The fabric has a gorgeous knit-like texture in the embroidery, and it can create the most beautiful, soft, chic gowns," explains the designer. 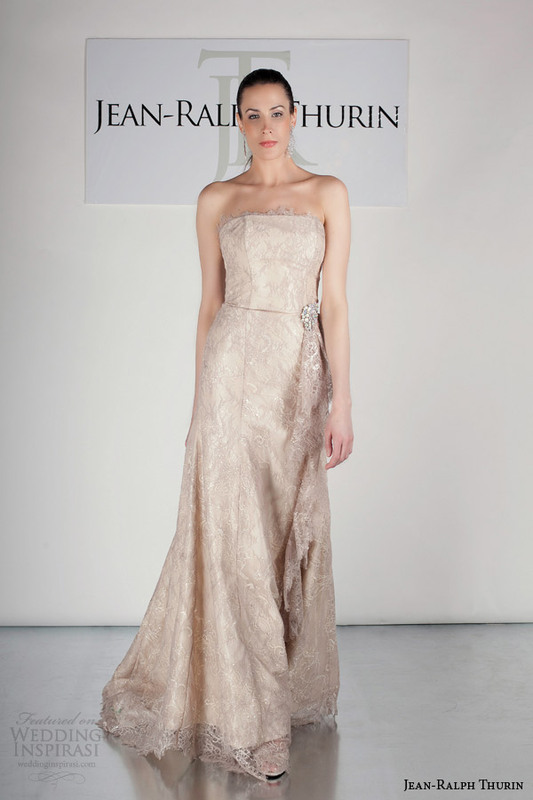 Known for his airy colors, he continues, "With this season, I am continuing my exploration of light metallic colors." These "non-colors" as the designer calls them, "are light enough to read like ivory, but have a little different luminescence." 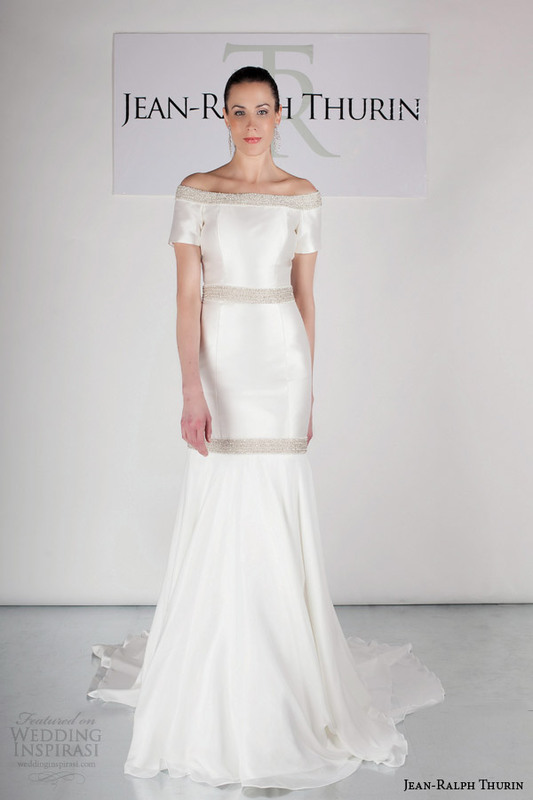 If you're a bride focused on quality and timeless style, take a look at Liancarlo. When asked about his ideal bride, Ramirez says, "I make it my job to work with a broad range of brides from all over the country. 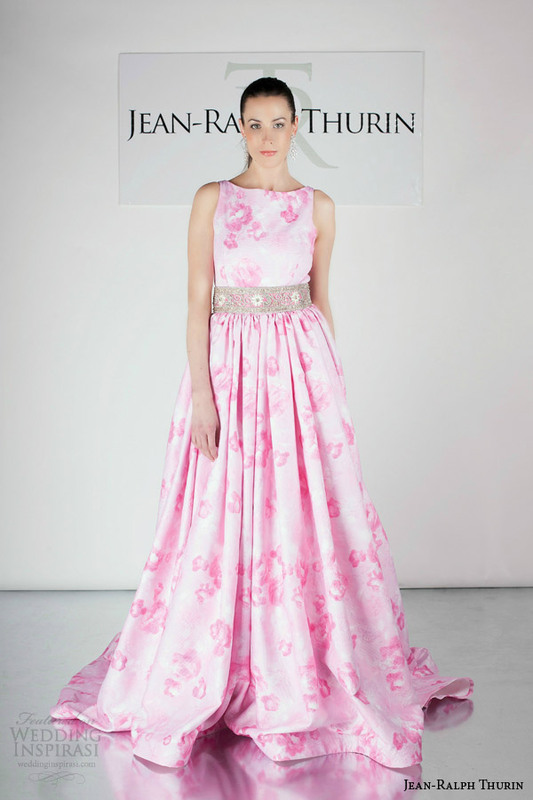 In my work, I incorporate themes of workmanship, fabric and embroidery quality, and a sense of timeless elegance." The designer cares more about personal style than trends. "I think the word trend by nature should be treated cautiously; it's so important that a bride not wear a dress or accessory that fits a trend, but not her own personal style," says the designer. His advice for great wedding day style? "Above all, a wedding is a day that a bride wants to remember for all the great moments, and all the right reasons. Sure, some things won't be perfect, but I always suggest to just let it go and enjoy yourself. 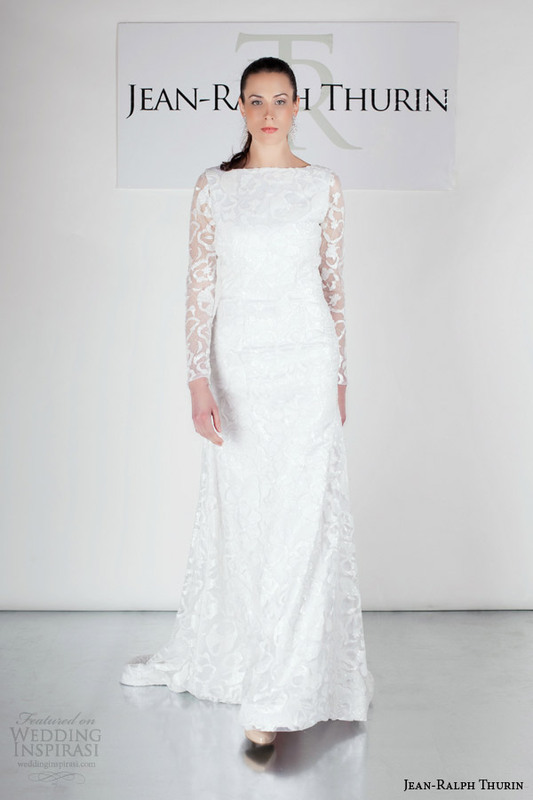 Your wedding day look will reflect how you feel, and feeling great will go a long way in making a bride shine." George Clooney Is Getting Married When?